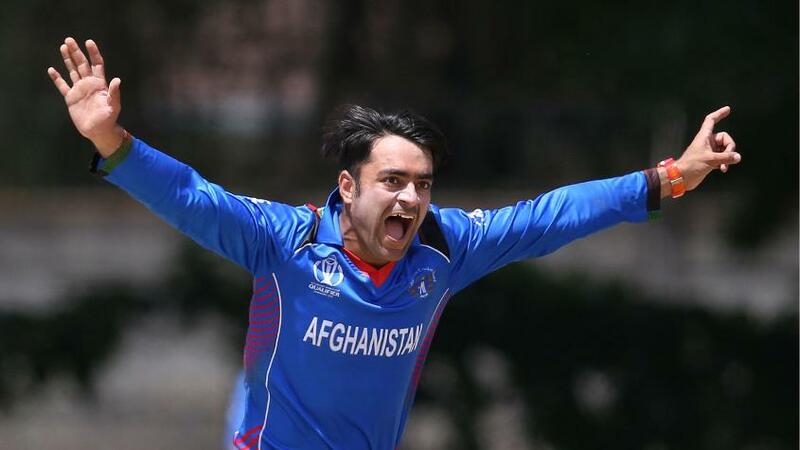 Rashid Khan's five-wicket haul was backed up a crucial partnership between Gulbadin Naib and Najibullah Zadran, as Afghanistan survived a scare against UAE to keep their World Cup hopes alive. Afghanistan recovered from a top-order collapse to defeat UAE by five wickets in the ICC Cricket World Cup Qualifier Super Sixes clash in Harare and maintain their slim chances of qualifying for the main event next year. The Afghans still require others results to go their way and must then defeat Ireland in the final Super Sixes match on Friday to secure their qualification, but at 54/5 in pursuit of 178 it looked as though all hope was lost. Mohammad Shahzad continued his disappointing tournament, as the keeper-batsman was trapped lbw by Qadeer Ahmed in the second over for just 3, and when the dangerous Rahmat Shah (16) was castled by Mohammad Naveed to leave the score 36/2, Afghanistan looked visibly rattled. Worse was yet to come as Naveed dismissed Samiullah Shenwari lbw three balls later and the returning captain Asghar Stanikzai had a wild swing at a short delivery from Ahmed and only succeeded in top-edging behind. The loss of the experienced Mohammad Nabi, caught behind for 6 off the bowling of Ahmed Raza, left Afghanistan five wickets down in the 16th over and teetering on the verge of an ignominious exit. It took a superb sixth-wicket partnership between opener Gulbadin Naib (74* off 97) and Najibullah Zadran (63* off 64) to get the run chase back on course, initially playing cautiously before opening up to play their shots. Gulbadin played the anchor role perfectly, surviving the early chaos and hitting four fours and two sixes in his innings, as Najibullah motored Afghanistan towards their target. The fact they reached it in 34.3 overs, and therefore boosted their net run rate, could yet have an impact on who qualifies for next year's tournament in England and Wales. Earlier in the day Shaiman Anwar's responsible half-century had provided the backbone of a below-par total as the irrepressible Rashid Khan took figures of 5/41, lifting his overall ODI tally to 96. The teenage leg-spinner needs just four more in his next nine ODIs to surpass Mitchell Starc's record for the fastest to 100 in the format. The innings had started badly for UAE after Rohan Mustafa, their captain, won the toss and took first strike. Mustafa took the adventurous route in the very first over, lifting Dawlat Zadran (3/45) over the infield for four, but after that a sequence of 20 balls went by without a run being scored. Something had to give, and Dawlat made it happen when he got Mustafa (4) to miscue a hoick, only sending it as far as Rashid at mid-off. Dawlat soon struck again, this time getting Ghulam Shabber (6) to edge to Nabi in the slips, and UAE were 15/2 in the ninth over, which became 18/3 in the 10th after Mujeeb Ur Rahman got the better of Mohammad Boota (3). The opener Chirag Suri (22) and Anwar mounted something of a comeback, putting on 41 before Suri fell, becoming Rashid’s first wicket, and the spinner soon struck again, trapping Muhammad Usman lbw for 13. By then Anwar had reached 32 but he looked in danger of running out of partners and decided to up his scoring rate, hitting Mujeeb for a four and a six in the 33rd over and getting to his half-century in the process. But Afghanistan continued to make inroads, Nabi dismissing Adnan Mufti before Dawlat grabbed a third and Rashid finished off the tail to leave his side with a target they would have been more than content with at the start of the day. Gulbadin and Najibullah's heroics ensured they also finished the day happy.